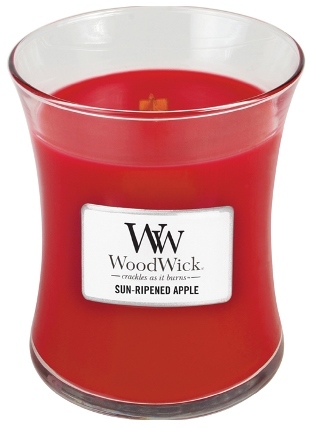 Sun Ripened Apple from Virginia Gift Brands was a fragrance I couldn’t resist purchasing. I love apple scents – all year long – and it’s a scent I had yet to try in a Wood Wick candle. If you haven’t tried a Wood Wick yet, I highly recommend you do. The sound effects are pretty cool and it adds a whole new dimension to the ambiance in a room. They’re always a big hit in my house and candles I love to burn when I have guests over. Crisp and cool, this sweet apple scent is almost as good as the real thing. Our highly fragranced jar candles feature a natural wooden wick to create the soothing sound of a crackling fire. Smelling the wax for the first time… fresh apple all the way. Tart apples drenched in sugar. Time to find out how this candle performs! Because this candle was so small, I stuck to a small powder room to burn this candle in. Once lit, it didn’t take long to reach a full melt pool and once it did… the freshest apple scent wafted all throughout the small room… fresh, sweet and crisp apples. The blow torch and crackling sound from the wood wick only adding more to the overall ambiance in the room. Loved it!! Strength – on a scale of 1 to 10, I would rate this candle an 8 in a small room. Wouldn’t even attempt this small candle in a larger size room. I’d leave that for the larger jars. This candle burned perfect. No issues. Clean burning from start to finish. I loved this fragrance and would totally purchase it again. It reminded me of a tart apple loaded with sweet sugar. A perfect scent to burn all year long. If you haven’t tried a Wood Wick candle yet, definitely try one. You won’t be sorry. They’re fun, different and the aromas are just an added bonus.